I'm writing this on Saturday the 11th, a week after departing on our 9-state bus journey spanning 7 days and 6 nights. It's already been a week? And in a couple of days it is back to work. Yuk. Plus it is soooo hot back here in the SGV! Here's a recap of day 1 of our journey that began the morning of July 4. We were supposed to assemble at the Ranch 99 market in Arcadia at 7:15. I dropped off Julie and our luggage, then drove back to put the car in our garage and walked from the house to the market. At least it was cool at that time of the day. It turned out we were the only ones on our tour who met at the market. There were several people waiting with us but when the tour bus arrived and we checked with the driver, he told us that wasn't our bus. Someone from our tour company showed up and transported us in his car to the next gathering point, a shopping plaza at the corner of Valley and San Gabriel Boulevard. Even that wasn't the true departure point. 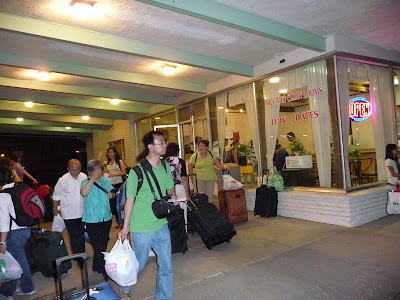 There were plenty of buses coming and going, dropping off and picking up people, and when ours got there, we boarded and were taken to the Knights Inn in Rosemead. That turned out to be the launching pad for our trip. 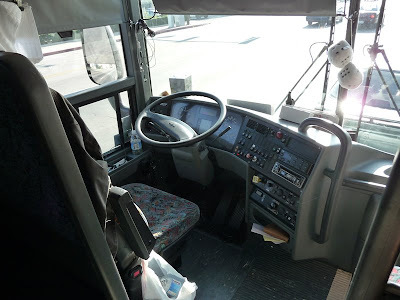 Here's a picture of the cockpit of the bus that took us to the Knights Inn - it wasn't the one that took us on our journey, however. The Knights Inn, right next to the 10 Freeway off the Rosemead exit, was the departure point for all the tour buses and there were plenty of them all lined up blowing fumes all over the place and disturbing whatever non-tour guests were staying at the Inn when we arrived. It was a madhouse. Each of us were told which bus was our actual tour bus so we found our bus, loaded the luggage and boarded for the beginning of our trip. Barstow was the first rest stop. The restrooms were combined with souvenir shops selling cheap trinkets and Indian stuff, and fast food eateries for the hungry. 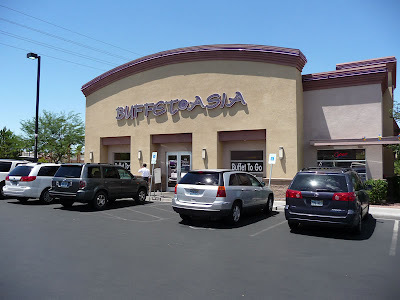 From there we headed to Las Vegas, where we ate lunch at a Chinese buffet on the outskirts of town: $10 all you can eat including drinks and tax and tip. Such a deal! 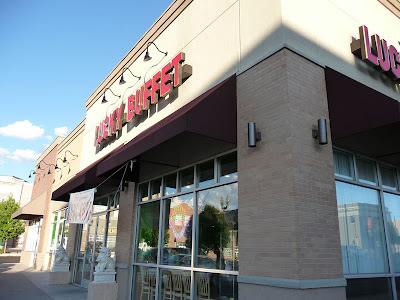 There were a couple of other fast food places nearby if you didn't want the buffet but they didn't look very appetizing so just like a magician forces the card that he wants you to choose, we chose the buffet. Above is a picture of our bus. 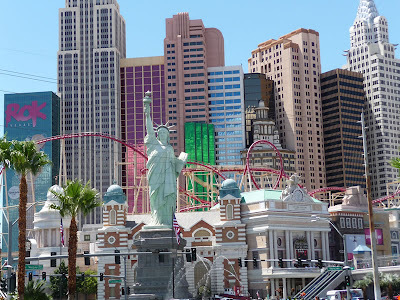 After stuffing ourselves we took a short journey over to the Las Vegas strip and a short stop to walk around a bit. We also took a side trip to New York on the way. Several folks joined the tour in Las Vegas, making our bus completely full. Now we headed to the next destination in Utah. 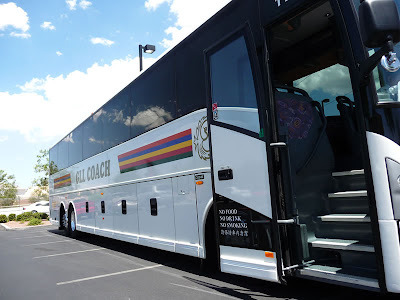 Below is a picture of the bus that was parked next to us in Vegas - I think this was a classical tour. The highway to Utah runs through Arizona for a little bit so that counted as our AZ foray; we stopped for dinner in Cedar City, Utah. 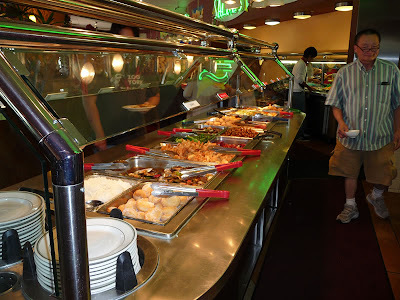 Once again, we were all offered a Chinese buffet, again priced at $10 all you can eat including tax, tip and drinks. Julie and I went across the street to Sizzler instead. 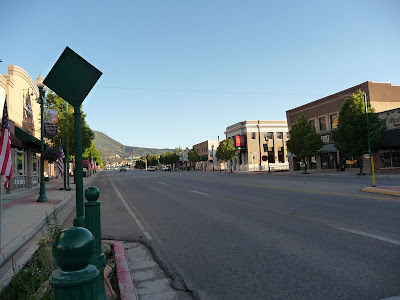 One thing that struck me about Cedar City was how clean everything looked. But then compared to So Cal lots of places look clean. From there it was back on the bus to Richfield, also in Utah, for our first stayover. Here's a picture of the Apple Tree Inn. Given that it was such a small town the accommodations were pretty basic but hey, they had wireless access and clean rooms so I had nothing to complain about. I had been expecting to eat meals at fairly normal times, like around noon for lunch and around 6 or 7 for dinner but we ended up eating lunch at 1:30 and dinner close to 8:00 and got into Richfield close to 10:00. 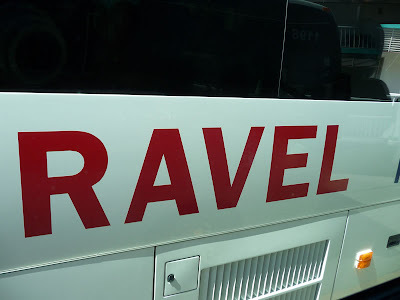 Most of the time was spent riding the bus but with destinations so widely spread, that is unavoidable. At least the driver knew how to drive fast! We also saw a couple of movies along the way, both of which were pretty bad. Scorpion King was really stupid and RV, featuring Robin Williams, was not much better. I was hoping they weren't setting the tone for the other movies that would be shown. That was day one.. pretty uneventful.